This is my very favorite stars quilt pattern ever….and of course it’s because there are NO POINTS of the stars to match up and stress over! 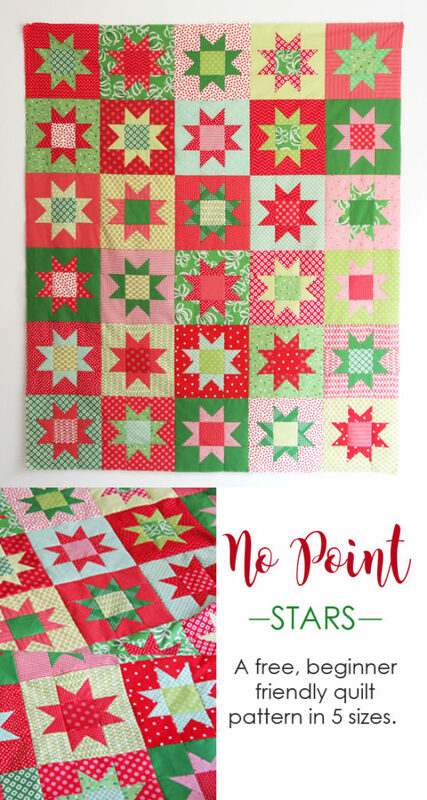 Thus the name “No Point Stars”…in case you were confused…naming quilts is not my talent! I decided to revamp my July Stars Tutorial with a FREE printable full pattern…because I love this quilt so much and I get questions about sizing and fabric requirements almost daily! 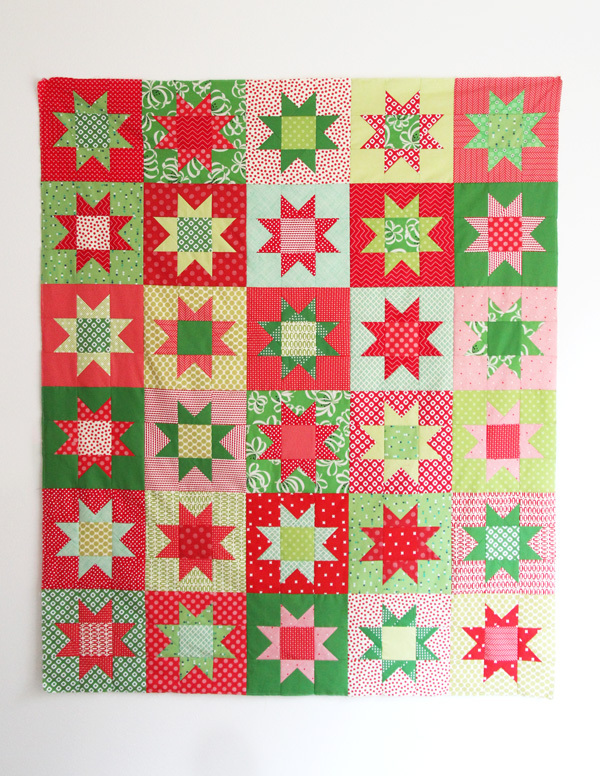 I’ve made it in reds and blues, and now red and green, but really this quilt is amazing in a variety of colors or even scraps. 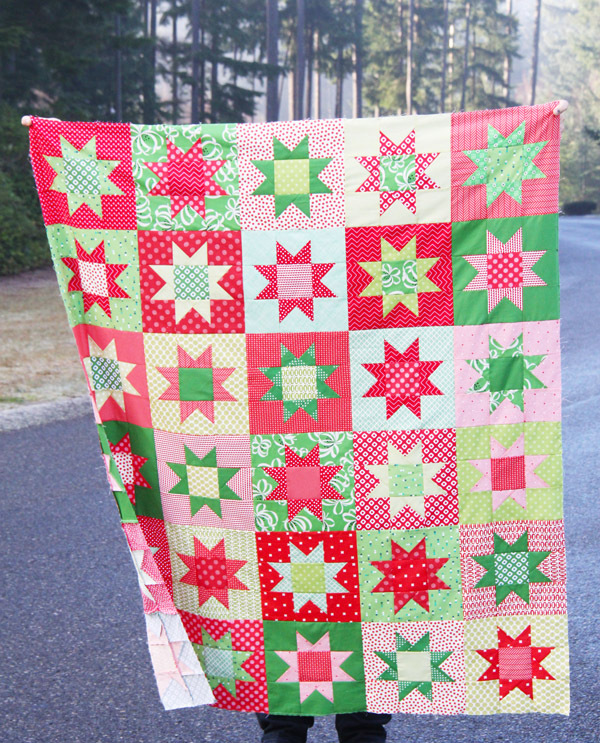 If you’ve never made a star quilt before now is your chance! You can find the printable PDF of the pattern below with 5 sizes and all (click the words or the photo below). Thank you for the pattern! I make QOV tops and am always looking for star block patterns! I just purchased the two you have in your shop! All three are going to make great patriotic quilts!!!! Thank you so much for this lovely free pattern Allison! You have a big generous heart! Little Jane looks so sweet behind the quilt! Thank you for sharing this pattern, I will make one in January. Your version is lovely! Thank you soooo much! Lovely pattern! But nevertheless… your daughter is the STAR in the picture :-) Have a Merry Christmas from Holland! Thank you for the star pattern. I can hardly wait to give it a try after the first of the year. Thanks for the star pattern. I consider it an early Christmas present. A star without matching points?…just my style. And I agree with one of the writers above… Jane is the real star…so cute! Bless you!! Thank you very much for the pattern, agreed you are our shinning STAR. Thanks for the free pattern! Jane is just the cutest! Merry Christmas! Wow! This is beautiful! You are crazy talented. Thank you so much for sharing!!! 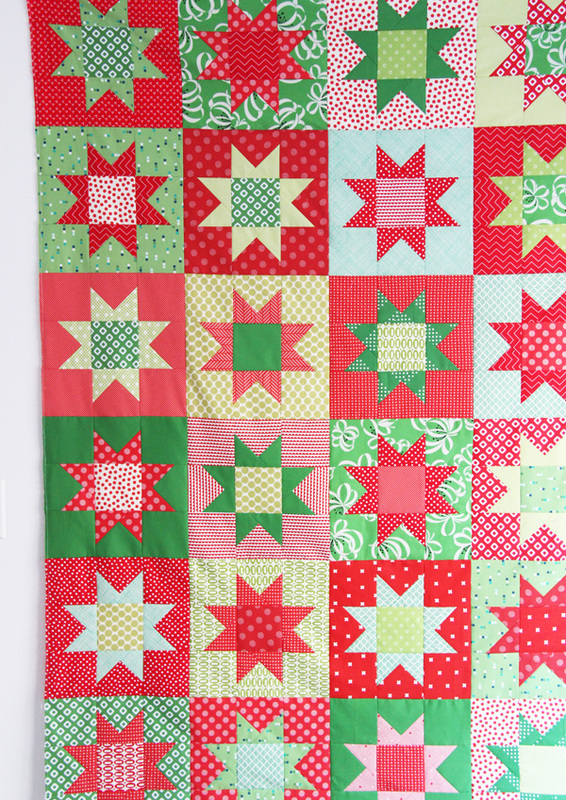 The fabrics you chose for your Christmas version of this quilt are wonderful! Thank you so much for sharing the pattern with all of us! I look forward to making this quilt! This is beautiful! How cute would it look made up in Heather Ross’s new Christmas line? It would be SOOOO good in her new line!!! And her fabric comes out in February…good timing!! Beautiful pattern, thanks and Merry Christmas! Thank you! I agree no star points to worry about makes for less stress and that’s always good! Merry Christmas to you and your family! Hurray! Thanks so much, love these stars. Lovely! Thank you so much for sharing this free pattern! Thank you so much for offering something so beautiful for FREE during this time of year. Have a Merry Christmas and enjoy your family time!! Thank you so much for sharing this beautiful pattern. I can tell it will be a go to pattern for me . I love it. Merry Christmas! I love patterns with stars in them! Thank you for making this one free and in 5 sizes! Merry Christmas to you and your family! Jane is getting so big and looks so happy among the stars! Very generous; Thank You for the free pattern!! I want to make it up in at least a dozen different color ways! Thanks so much!!! Love it! Merry Christmas to you too. You make my favorite patterns as they’re always well written with multiple sizes! Thank you Allison for this generous gift. What a sweetheart you are. Merry Christmas to and yours. It is so beautiful and cheerful! Thank you so much! Merry Christmas to you and your family! How pretty and how thoughtful!! Thank you and Merry Christmas! Thanks so much for your kind and thoughtful generosity. 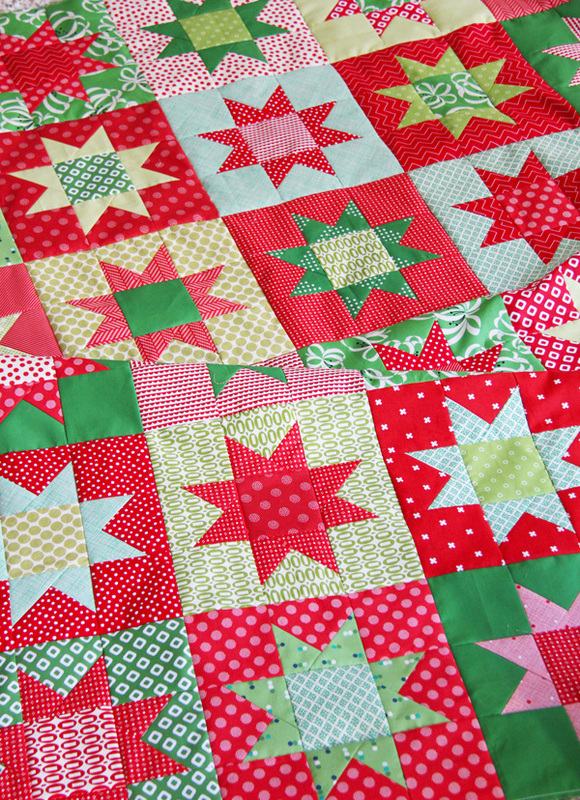 My favourite quilts are star quilts, and I have lots older fabric to use up! Thanks so much! You just made my Christmas! Your patterns are so simple!! Love it! Woohoo! If I didn’t know better ;), I might suspect that this a last minute effort to get on the nice list! What a beautiful, easy star pattern! Thank you so much, Allison, and a Merry Christmas and a happy and healthy New Year to you and yours! Thank you for the Christmas gift – I printed it off and I’m ready to start collecting fabrics. You’re so kind. xxoo – and Merry Christmas to you & your adorable family. Thanks Allison! Great pattern! Have a wonderful Holiday Season!!! Thank you so much for such a lovely pattern! I look forward to making this quilt in 2018! Thank you Allison! How generous of you. Thank you for the lovely gift Allison! Merry Christmas to you and your family! Thank you Charlotta! Merry Christmas! Thank you for sharing! Merry Christmas! Love this pattern!!! No points is awesome!!! Have a Merry Christmas!!!! Thank – you so much ! Merry Christmas to you and your family. Thank for the pattern. You make the best quilts! Merry Christmas to you and your family! 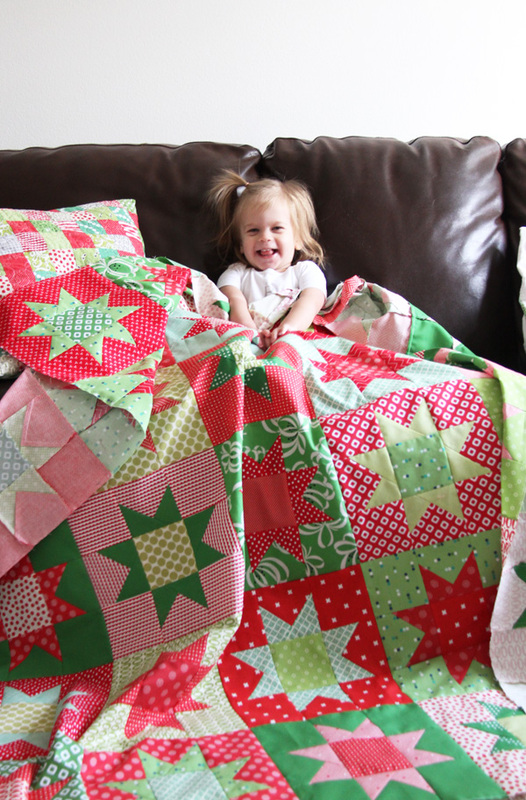 What a fantastic photo of that little smiles amidst the quilty goodness! Thanks for sharing your pattern – it’s definitely on my To Make List. I have loved the patterns I have purchased from you and this one will surely become a favorite as well…thank you for sharing your talent with us and for your generosity in giving us this wonderful pattern. Merry Christmas to you and your family! Allison, you are a doll. I am so glad I follow your blog. You are such a sweet and creative person. Thank you bunches for this pattern, it will make a fun quilt, I love stars!! Thank you, Allison. I love July Stars, and used it to make a quilt for my guild’s Quilts for Wounded Warriors project. We make 48″ x 78″ gurney-sized quilts for medical evacuees from a military hospital in Afghanistan. I will give my guild the link to this new pattern. Thank you for sharing (again) so generously. I’ve added this to my very long list of quilts I hope to make in 2018. Thank you for the star pattern. This will be a nice pattern for a beginner like me to try. Bless you and have a wonderful holiday season. I love your floating july Stars — I’ve made it several times! Thanks for the full pattern….Merry Christmas to your and your family! Thank you so much for this pattern….I love it. Merry Christmas! Thank you very much for this free pattern! I love this quilt. I think stars are my favorite thing to make. Thank you so much for the pattern! I really enjoy your blog and your pattern…just made the Mini-pumpkins! This is so cute! I’m trying to decide on a pattern that will show off a large-scale novelty print. This might be just the ticket. Allison, just came across this pattern. Thank you for a lovely freebie. Happy 2018 to you and yours. This pattern is awesome. I just finished a star baby quilt and am so pleased with how it turned out. The pattern lends itself to so many possibilities and I was able to use some left over 3 inch square ninepatches for the center. Many thanks for this pattern. It is one of my favorites already! Thank you for creating this pattern! I love a good star pattern, and one that doesn’t require points is even better!! I do have a quick question…. the pattern states 1/4 yard of each fabric (so total of 1/2 yrd, if I go yardage route instead of FQ) for all sizes?! Is that correct?! I’m not very good at quilt math but that surely doesn’t seem right for a crib size all the way up to a king?? HELP! Where have I gone wrong?! Hi Jade, The material requirements for the Throw size for example…say 15 FQ OR 1/4 yards for Color 1 and 15 FQ or 1/4 yards for Color 2. So if you are using yardage, you’d need 15 different 1/4 yards of each color. You can use 1/2 yards too and just cut according to the cutting directions for 1/4 yards…just cut double. You just need a total of 15 assorted 1/4 yards for each color. Hope that makes more sense? Thank you so much for this!! I am trying to participate in the Moda Block Heads 2 and block 5 with those 16 flying geese put me into a tailspin! After using 3 fat quarters I just gave up. In fact, now I am two behind. And today, I see this on Instagram!! I can make the geese like these. And, I have a lot of fabric to make a quilt!! Thank you so very, very, much. Oh I’m so glad! Sounds like it was perfect timing!! Thank you for sharing this beautiful design and such great instructions. I am fairly new to patchwork and have never attempted stars, but this has given me confidence to give it a go. Just popping in to say “Thank You” for your free pattern. So quick and simple to sew. I just made one block as a sample and it turned out really cute. I see many more in my future. You can see my little project here:https://flyawayhome-4am.blogspot.com/2019/02/one-thing-led-to-another.html Thanks again! It’s so darling Lucy! How fun to use it in Valentine’s fabrics!